The industry's first 4G LTE-enabled slider from Samsung is a capable offering for Verizon users on a budget. QWERTY slider keyboard fans don't have a whole lot of choice when it comes to 4G LTE data, but they could do a lot worse than the Samsung Stratosphere. It's not a handset intended for Android power users, but the sum of its parts is overall a good value. Not all that long ago, tapping into Verizon Wireless' rapidly expanding 4G LTE network meant choosing a huge, expensive smartphone with poor battery life. But oh, how things change in just a short time. Billed as "a Galaxy S phone," the carrier's Samsung Stratosphere (aka SCH-I405) nicely fills a niche as the first 4G LTE-enabled smartphone for users who prefer an old-school slider QWERTY keyboard coupled with a 4.0-inch, 800x480 WVGA Super AMOLED touchscreen display. Weighing in at 5.8 ounces and measuring 4.96 inches tall, 2.54 inches wide and a not-so chunky 0.55 inches thick, the Samsung Stratosphere offers a nice compromise for users who want a slightly larger display. However, it does so at the expense of being able to comfortably hold the device to your ear for any length of time while having a conversation. 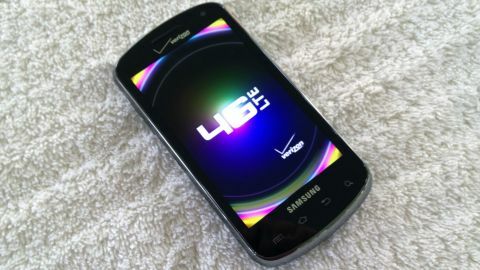 The front of the Stratosphere features a thin earpiece slightly raised above the surface of the display, with a Verizon logo emblazoned below. A 1.3MP front-facing camera is embedded at right. At bottom are four capacitive buttons for Menu, Home, Back and Search, crowned by a Samsung logo. Up top, the device features a lone 3.5mm headphone jack, with power/sleep button on the right side, placed just a bit too high for our thumb to comfortably press. The bottom features a lone micro-USB 2.0 port at center, while a volume rocker rests at the top left side. The back of the handset includes a 5.0MP auto-focus camera with LED flash. The keyboard slider requires both hands to open, but it's solidly built and the keys are firm and easy to type on. Verizon Wireless offers the Samsung Stratosphere for $99.99 with a two-year agreement ($409.99 retail price); a 4G data plan is required.